Cherry Creek neighborhood in this map of Denver's neighborhoods. Two major commercial centers exist in Cherry Creek along the major traffic route of East First Avenue. First is an upscale, enclosed shopping mall, the Cherry Creek Shopping Center, which anchors the neighborhood. Second, the main shopping district of Cherry Creek North is also located along East First, Second, and Third Avenues from University Boulevard to Steele Street with much of the remaining areas of the Cherry Creek neighborhood remaining residential. The Cherry Creek North shopping and dining district is a 16 city-block area with more than 320 upscale galleries, boutiques, restaurants and salons/spas and the pedestrian plaza Fillmore Plaza. 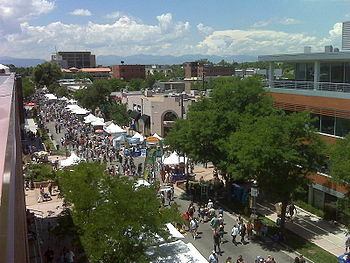 Fillmore Plaza is home to numerous community events including Films on Fillmore (in summer), the Cherry Creek North Ice Rink (in winter) and the Cherry Creek Arts Festival. Cherry Creek North was also home to the originalTattered Cover Bookstore. The area is served by the Cherry Creek News, a community paper. As of the 2000 Census, there were 5,028 people living in 3,198 households in the Cherry Creek neighborhood. The mean household income was $95,236.93. 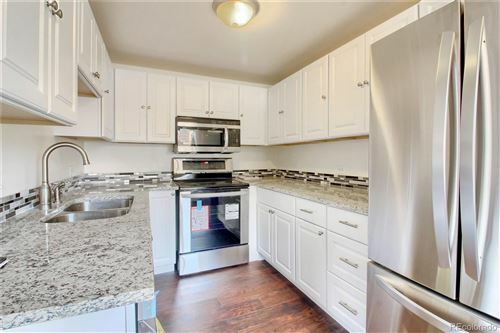 In 2002, the average home price in Cherry Creek was $692,764.00. It was estimated in 2001 that the neighborhood was home to 15,004 jobs. Congress Park is a park and a neighborhood in the City and County of Denver, Colorado. In 2010, the neighborhood had 10,235 residents and 5,724 households.